Today is my first day back to work full-time. 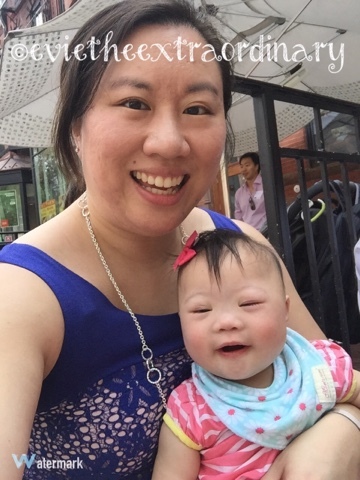 I feel lucky to have had more time with my daughter, although I wish she didn't have to go through so much during the first few months of her life. Turns out she pooped so much, she soaked through her Zipadee Zip and her sheets, and then he changed her, and then she pooped again, and Grandma had to change her. Yay for Team Moy! And yay that Mommy didn't have to change this one! 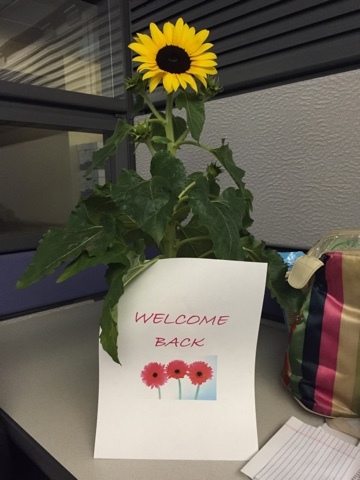 This morning started off with a meeting, and they greeted me with a big potted sunflower to welcome me back. That was so sweet! If you're the praying type, we could use prayer for Evie that she would drink from the bottle for Grandma. Evie has decided that she will only drink from the bottle from Mommy, and that's not going to work. Thankful for the G-tube today! Looks like you survived your first day back! Hope Evie survived it too! Emmy is also on a bottle strike and will not take it at all. Not even a sippy or straw cup. Dan had to spoon feed her milk which she only drank an ounce while I was gone. Hope these girls learn soon! Haha! Just noticed the cute bandana bib on Evie...which kind is it?